When we were here last year, we visited each of Durango’s five breweries and determined there are only three worth the effort. 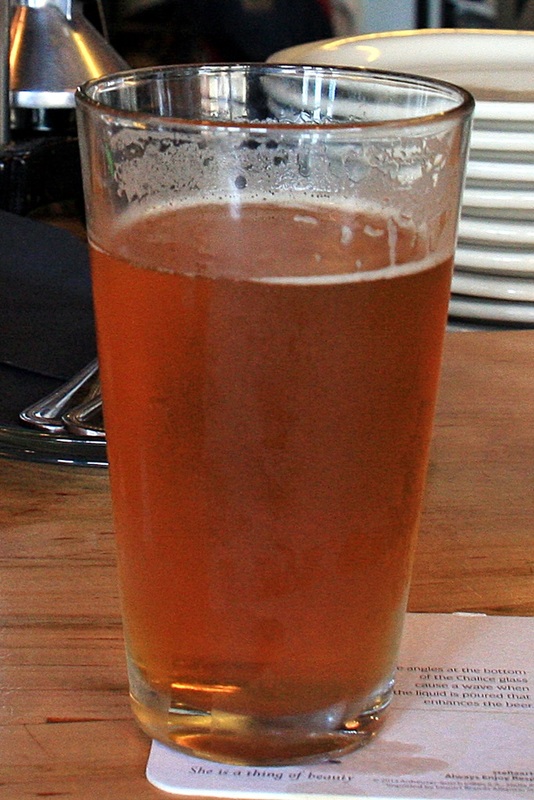 The first one we checked out this time is also the newest and has the unimaginative name, Brew Pub & Kitchen. In spite of that deficiency, their brews are quite tasty and this day we both had their Kole Porter, a very smooth session ale (low alcohol). We also had a good conversation with Mark, a semi-local, who gave us some good tips for places to eat in Durango. The next day we headed back downtown and to Carver Brewing. We were lucky to get two seats at the bar because the place was packed with folks watching some soccer game on the big screen TVs. 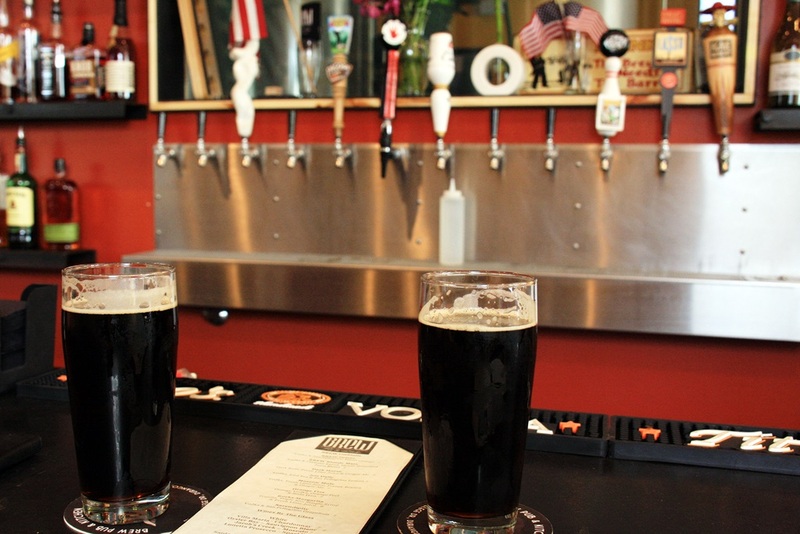 Our attention, however, was on the Colorado Trail Nut Brown Ale and the Iron Horse Oatmeal Stout in front of us. 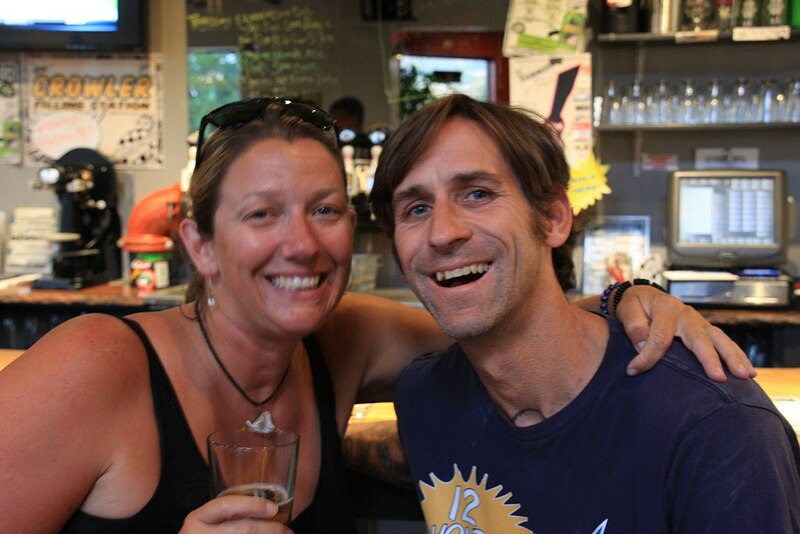 That evening Karen and I stopped by Ska Brewing just to have a brew. 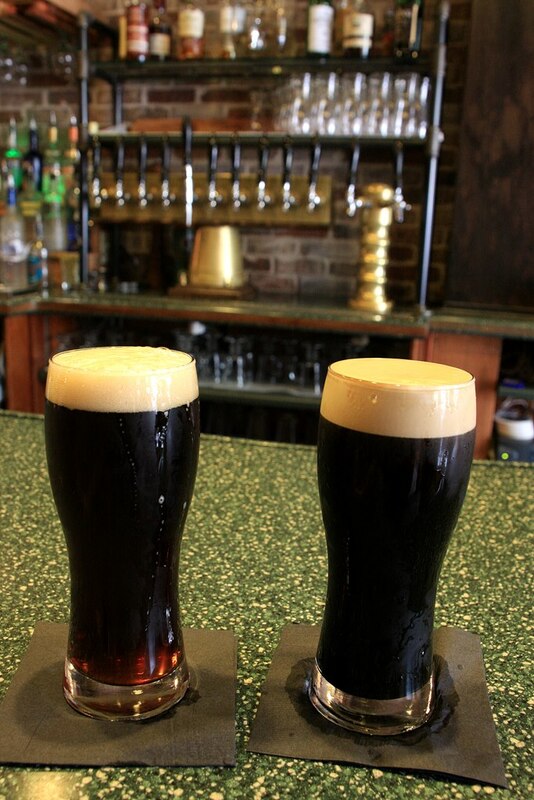 Karen tasted their Buster Nut Brown Ale and their Estival Cream Stout and since she couldn’t decide on which one, she had them both blended together in a pint – turned out really good, too. I had the Special E.S.B. and thought it tasted a lot like their Pinstripe Red Ale and that’s not bad at all. We soon struck up a conversation with the local couple we were sitting next to, Jess & James. They were fun to talk to but the eight o’clock last call came very quick and it was time to go. 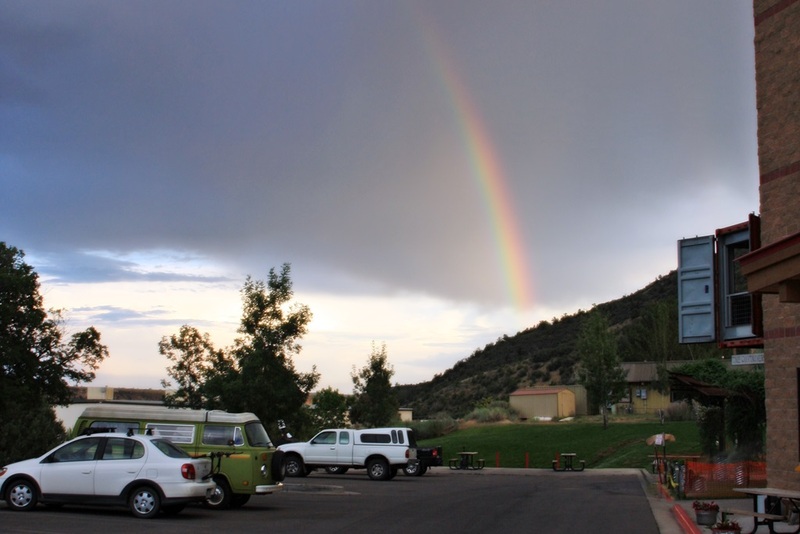 As we stepped out, we were treated to a bus in the parking lot and a rainbow in the sky … sweet! There is a fellow VW bus owner that I know from the VW enthusiast web site, The Samba. Last year when we were here, we got a picture of his bus and I posted it online which started a conversation. We both thought it would be cool to meet in person this year and we arranged to do so on Thursday evening at Ska. We were told it was BBQ night at Ska and there would be live music and a crowd so Karen and I arrived early. We were delighted to hear the sounds of a bluegrass band (called JRPT) as we walked across the parking lot to where the action was. I went back to the car to grab our folding chairs, got an E.S.B. for me and another blend of nut brown and cream stout for Karen, and we settled in to wait for Rich to arrive in “The Bone Bus”. 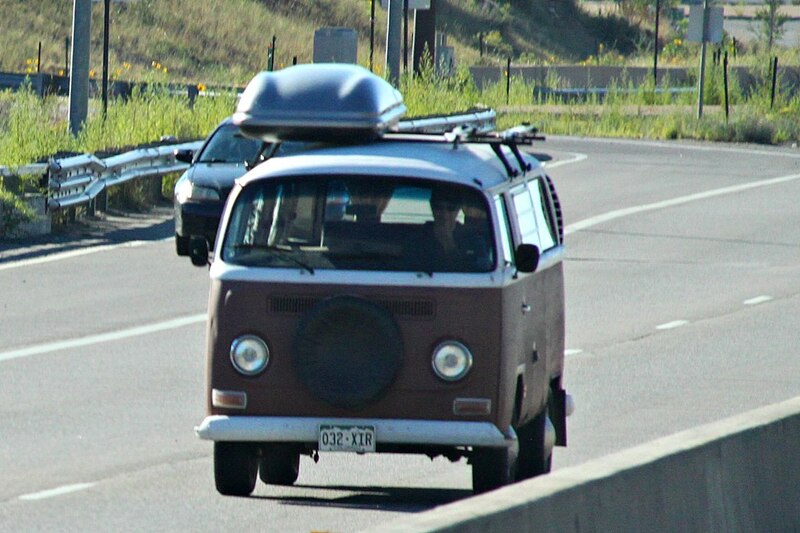 When I saw his bus pull into the parking lot, I headed over, introduced myself, and got a tour of his ’68 tin top Westy. 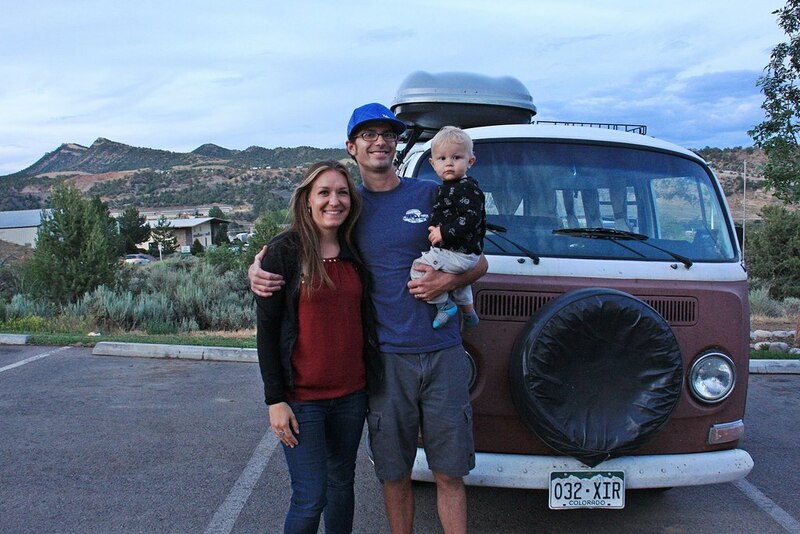 Rich and his wife, Bailey, and their baby, Miles, had recently returned from a two-week, 3000-mile camping trip out to California and back – in his 46-year-old bus! We had a great time getting to know them, talking VWs and getting the low-down on Durango. We like this place a lot and, you know, WCLH. 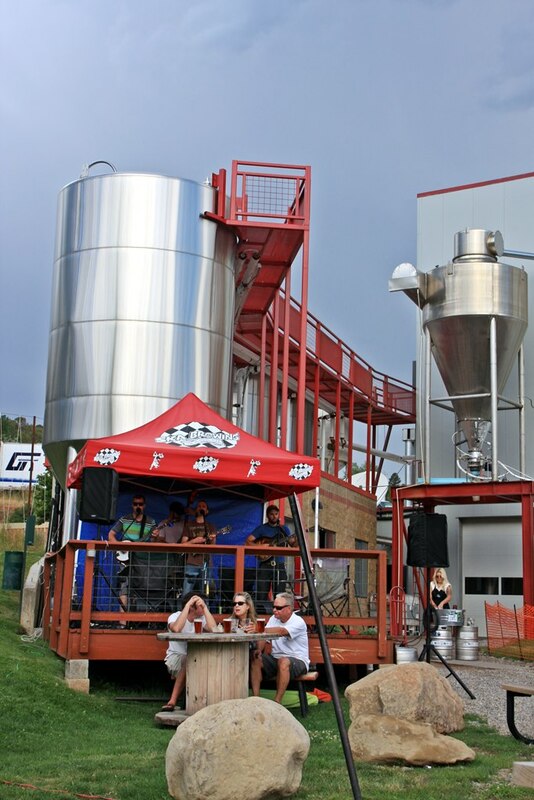 This entry was posted in Barbeque, Beer, Colorado, VW Bus and tagged BBQ, Beer, Breweries, Brewery, Bus, Craft Beer, Motor Home, motorhome, RV, Scenic, Travel, Volkswagen, VW Bus. Bookmark the permalink. We made it to Bend, Oregon, today and get to stay awhile – YAY! Where’d he lose that tooth? I can’t find it here. We’ll help him look for it when we return in October.